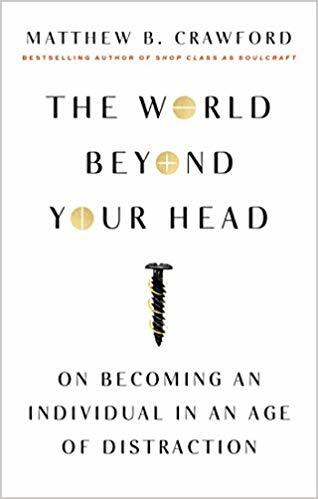 The World Beyond Your Head: On Becoming an Individual in an Age of Distraction. Crawford investigates the intense focus of ice hockey players and short-order chefs, the quasi-autistic behavior of gambling addicts, the familiar hassles of daily life, and the deep, slow craft of building pipe organs. He shows that our current crisis of attention is only superficially the result of digital technology, and becomes more comprehensible when understood as the coming to fruition of certain assumptions at the root of Western culture that are profoundly at odds with human nature.